Last spring I finally made the leap. Like many other college instructors, I’ve found the traditional term paper a less-than-inspiring exercise. Students, infamously, do not read a professor’s comments unless a rewrite is required, and even then many will simply want to know “what do I need to do to get an A” or whatever target grade they need. It’s hard to blame them. In a big lecture class, they know that theirs is but one of 70, 80, maybe 150 papers that the instructor (or a graduate student grader) is wading through. So I bit the bullet, chucked the term paper, and assigned a Wikipedia contribution in my upper division labor history lecture with 85 students. It was a wild ride, but in the end it was successful enough that I want to do it again. Since a number of colleagues have asked, and for my own planning, I’m posting some notes on the experience. If you have more questions or feedback, feel free to comment or email. The Rationale: Beyond the desire to escape the negatives of traditional papers, Wikipedia has a number of positive attributes that make it a useful environment for learning about writing, research, and the circulation of knowledge in the digital public sphere. Wikipedia is now over a decade old and claims over 4.2 million articles in the English language version alone. For better or worse, it is a common research tool for students, the general public, and even (gasp) professors. Although nothing in the digital realm last forever, the time is long past when we can imagine it as a fad. Like JStor and GoogleBooks, Wikipedia is part of the instructional ecosystem. The only question is whether students will learn to use it appropriately. Given the pervasive use of Wikipedia as a basic information source by students, journalists and the public at large, professional historians in general ought to be more engaged with the platform. All the more so for Labor Historians because topics in our field, and related social justice topics, are not consistently represented despite the efforts of a number of very active individual editors. There are significant, and sometimes surprising, gaps in the topics represented and quality of existing articles. When I was preparing my Wikipedia course assignment I developed a 3 page list of Articles to Add or Improve. Most of these now have much more material, but there is still plenty of room for improvement. One reason topics like these are less well-represented than, say, detailed histories of automobile models, is the demographics of the Wikipedia editor corps. Research by the Wikimedia Foundation found that 90% of Wikipedia editors were male. In response, feminist activists organized an international edit-a-thon that aimed to improve the quality and visibility of women’s studies topics on Wikipedia, and also to encourage women to become familiar with Wikipedia and join the ranks of editors. Similarly, WP editors are overwhelming from northern hemispheric, industrialized countries, and some post-colonial scholars are promoting the active participation from the global south. In terms of gender representation, almost any college course is substantially more representative than is typical of Wikipedia editors. And many college courses will include greater proportions of African Americans, immigrants, and non-US citizens, not to mention low and moderate income people, than is typical of Wikipedia editors. So by turning our students into information producers rather than mere consumers, we can participate in the diversification of one of the most widely-read publications in the world. Preparing Yourself & Your Students: Writing for Wikipedia is an experience quite unlike writing a term paper. You and your students will have to unlearn certain habits, especially the strong desire to do all assignments at the last moment. Instructors, too, will have to overcome the desire to “wing it.” If you’re working with Wikipedia you are automatically working in collaboration, and good collaboration means planning ahead. If you’re not registered yet, get yourself a user account right now and start making little edits. Users get heightened scrutiny from editors right after they are created, so it’s good to have a track record to let editors know you’re not a vandal. Check out the extensive training materials for instructors and students, and heed some of the suggestions for building the Wikipedia assignment into your entire course, not just something at the end. You might want to read Amanda Seligman’s useful essay Teaching Wikipedia Without Apologies, or Wiki Writing: Collaborative Learning in the College Classroom (both free online). Find a campus or regional Ambassador who can help you locate volunteer editors who might want to help out. Change your syllabus because, to repeat, this works best if you integrate the Wikipedia assignment (including mastering the guidelines, training in editing, etc.) into the entire life of your course. Register your course, and create a course page that each student signs up to. Wikipedia is a highly developed collaborative community with well-articulated standards that are often mystifying to newcomers. In case you’re completely unaware of the phenomenon, a “wiki” is a collaborative writing platform that develops over time as users add, change and delete information, pages and links. Any user can edit any page without prior permission, although in practice there are limits. The system saves every version of every page (along with the name or IP address of the editor, and the time the edits were made). You can compare any two versions, and easily revert to previously saved versions. This should be a recipe for chaos, but cadres of (mostly) volunteer editors police Wikipedia watching for vandalism, plagiarism and copyright violations, and other transgressions of the system’s editing standards. In my experience three Wikipedia editing concepts were especially confusing for students: Neutral Point of View (NPOV), the prohibition on “original research,” and standards of “notibility” for entries. The rationale for each goes back to the fact that Wikipedia is a reference work that is intended to distill established knowledge found in other sources. Surprisingly few college students fully comprehend the utility of a good library reference room, perhaps because they are used to Googling their research questions. Writing for Wikipedia forces students to come to terms with the relationship between reference, interpretation, and primary sources–distinctions that have been flattened out with the mass digitization of books and archives. At the top of the Wikipedia list of concepts is Neutral Point of View (NPOV) which Wikipedia defines as writing “fairly, proportionately, and, as far as possible, without bias” on a topic representing all the views that have been presented in “published by reliable sources.” This should be No Big Deal. However, students have become so familiar with the thesis-driven essay that they often have a hard time understanding neutrality. Does it mean you cannot right about controversial topics? Does it mean all interpretations, no matter how marginal, need equal space? Not at all. But it does require a different tone and approach to content. The ban on original research, likewise, tends to confuse students (especially the better ones) who are eager to pursue a topic to its ends. But the rationale for this policy makes sense in the context of community verification. We can’t expect volunteer editors to follow up original archival research, so evidence in Wikipedia has to come from widely available sources. Luckily, Wikipedia’s standards for reliability are not too far off those of university professors, including scholarship in peer-reviewed journals, university press books, and mainstream news outlets. Finally, “notability” is often a problem when it comes to labor and social movement topics. In an effort to limit the proliferation of entries in trivial topics, Wikipedia requires topics with their own pages to be “notable“–mentioned in some reliable published source. This is fine, except that some important labor topics are most widely covered in movement sources (like party or union newspapers). Some self-appointed watchdogs of Wikipedia will object to these sources as insufficiently neutral, or will complain that “not every little strike” deserves its own page. You students may need to find a larger topic in which their smaller event or person falls. But in general, if at least two published sources refer to the event or person, a page is justifiable. For U.S. labor topics of the 19th and early 20th century, especially biographies of activists, the American Labor Who’s Who often gets you half way to notability. Recently, Wikipedia added a system for hosting courses and student assignments, and extensive resources that lay out detailed suggestions for structuring your course around Wikipedia. There is even a visual editor that frees new users from having to master arcane wiki markup code. This is a huge help for instructors. The first time I tried editing with students (back in 2007), the contribution was deleted almost immediately. This still happens all the time, but if you work through the course hosting system, student contributions will go through a formal vetting process before they are released into the public Wikipedia, or given an explanation of why their contribution doesn’t fly. The Student Experience: In my course, students could edit as individuals or in groups. I provided a long list of entries that needed to be created or needed significant improvement. Students who wanted to do something not on the list had to give me a good explanation why, and not many did. As expected, students who took the assignment seriously and learned the editing system ahead of time, did well. Students who waited until the last minute crashed and burned. The ratio of engaged-to-oblivious students was not unlike a regular term paper assignment, maybe a little better. Students who thought they might get away with overzealous copying (i.e., plagiarism) found themselves called out by volunteer Wikipedia editors who quickly found the original sources. Students who were serious, got pointers from editors about formatting and linking to other articles. In general, students found the work much more detail oriented than they are used to in a regular paper. It’s harder to be lazy on Wikipedia than it is in a traditional paper. Volunteer editors confronted students with requests for sourcing for assertions they thought were “facts,” which drove students back to the library reference room to fact-check their own work. Although I don’t have any systematic evidence, I think many students took feedback from Wikipedia editors more seriously than they would a professor’s because it was more consequential. Getting published on Wikipedia was more of a prize than a slight change in grade. On evaluations, a common refrain was that the assignment was difficult, but “cool” (as quoted in the student newspaper) because their work was live for the world to read. Among the pages my student created last spring (although most have some changes since last spring) are those for Ernest Riebe, Oscar Ameringer, the United Canary, Agricultural, Packinghouse and Allied Workers of America (UCAPAWA), and the Southern Tenant Farmers Union (STFU). If I’m not mistaken, Ameringer and Riebe were new pages and the other two were major expansions of existing pages. Links to all the student pages are available via the class portal. (Note, most of my students editing took place in late May to early June 2013, if you want to look at the page histories). Changes for Next Time: As a first big leap into Wikipedia for course assignments, I was satisfied with my experience. But I will make some significant changes in the future. The biggest lesson learned was how complex and multifaceted the assignment is. In future I will cut down on other assignments, and more closely tailor the entire class to writing on Wikipedia (as the tutorials for instructors suggest, but of course I ignored because I thought I was special). Group work was surprisingly successful and I will lean toward group editing in future especially in larger classes, not least because it cuts down on the volume of individual hand-holding. Also, given that the number of truly “missing” articles is getting smaller, I will focus student work on improving and expanding existing articles or sets of articles, particularly articles considered important by organized editing groups like the Organized Labour Portal. The goal here would be to get an article in shape so that it can be featured on on the Portal. A Few Words about Expertise in the Wikipedia Community: As I mentioned, labor and social justice topics are not consistently represented on Wikipedia, however, there are individual editors improving the situation every day, literally. Some of these editors, like Tim Davenport who edits as “Carrite” and runs the Marxisthistory.org site, are prolific and hugely knowledgeable. 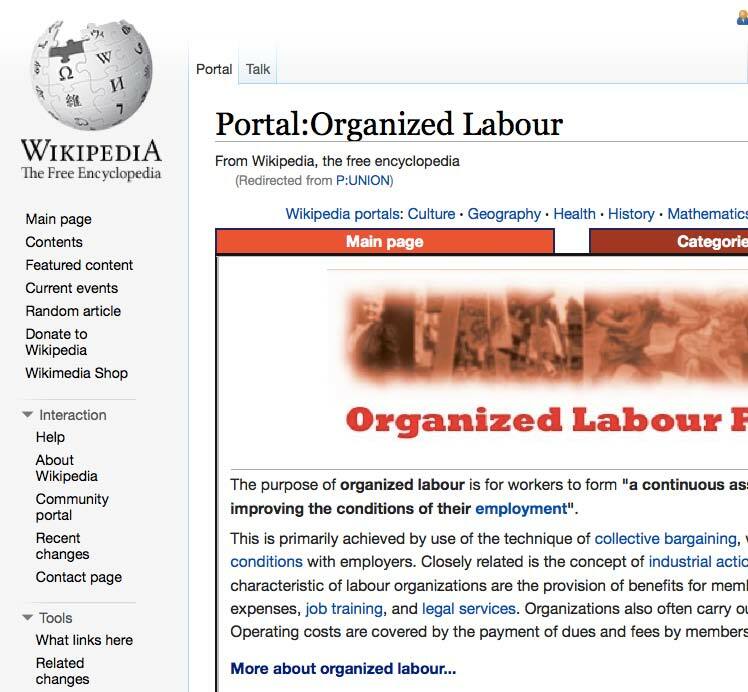 In addition, the Organized Labour Portal and WikiProject Organized Labour coordinate work on the topic. That said, not all established Wikpedia editors are friendly to labor and radical topics, and probably a larger group are simply indifferent. You may encounter less than civil interactions from these self-appointed experts, despite long-established rules for civility. Professional historians and graduate students venturing into the Wikipedia world for the first time should pause to consider that university credentials do not automatically grant you expert status. This is a well-developed system with its own norms for tone, sourcing, and relevance. It is also a community with many different personalities. All of this deserves respect, especially at first. So give yourself some time to get familiar with the system, and develop your own track record of editing before diving in with your students. This entry was posted in History, Labor, Teaching, Technology and tagged labor history, teaching, Wikipedia. Bookmark the permalink. Thanks for your thoughtful reflections on assigning a Wikipedia writing assignment to your history students and for sharing these valuable resources. In addition to Cummings/Barton’s Wiki Writing and Seligman’s essay in Writing History in the Digital Age (http://writinghistory.trincoll.edu), readers also may be interested in Siobhan Senier’s essay in Web Writing (http://webwriting.trincoll.edu/communities/senier-2013/).